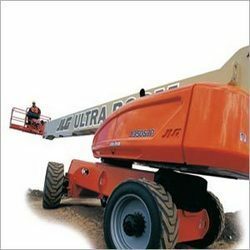 Jlg and Genie 120feet Boom lifts available for hire and also for sale all over india. To meet the varied requirements of the market, we, J. K. Enterprise, provide the best grade products that are sourced from well known manufacturers. Our manufacturers are well aware of the market and thus, offer us the products that matches to prevailing demand of the customers. This enable us in attaining their utmost satisfaction. To ensure that our clients are fully satisfied with our range of products, we relentlessly work to offer customer-oriented services. By delivering consignments within the promised time and providing effective and prompt customer back-up services, we have attained a distinguished position for ourselves in the global arena. We are a prominent trader and service provider of Boom Lift, Scissor Lift, Crawler Crane,Manlift, Cherry Picker, etc. Our product line is well known in the industry for its high load bearing capacity, effective functionality, exceptional performance and long service life. The equipment we offer are used in building, factories, offices, etc. For storing our comprehensive range, we have established spacious warehouse, which is well-equipped with all the modern facilities. Further, we have employed experienced quality controllers who stringently monitor the procurement process and further cross check these range on the basis of well defined parameters.